The FDA has received reports of children who consumed more tablets than recommended, because the containers do not have child-resistant caps. An ongoing inspection at the manufacturer also indicates substandard control of the manufacturing operation. A consumer update issued with the FDA news release states: "Belladonna is commonly known as Deadly Nightshade. It is a plant whose leaves and berries are extremely toxic. Belladonna has been used as both a poison and a medicine throughout history." After consultation with the FDA, the manufacturer (Standard Homeopathic Company) announced a voluntary recall. The designation "3X HPUS" means diluted to a concentration of 103 according to the methods described in the Homeopathic Pharmacopeia of the United States. (X = 1:10) For belladonna, the whole herb is used to make a mother tincture that undergoes three 1:10 dilutions with a water/alcohol mixture. The HPUS describes the characteristics of the plant, when it is harvested, alcohol content, and the dilution factor permitted for OTC marketing . It does not state any product's purpose. Belladonna is included in the Tablets to ease the redness, inflammation and discomfort of the child's gum that often occurs during the teething process. Belladonna 3X HPUS is manufactured from the whole plant, of which a small portion is Belladonna alkaloids (the component sometimes associated with side effects). Each Teething Tablet (which weighs about 65 mg) is composed of 0.0003% Belladonna alkaloids as stated on the label. This means that each complete teething tablet contains only approximately 0.0002 mg of Belladonna alkaloids. The amount of Belladonna alkaloids in teething tablets is minuscule, especially when compared to conventional medicine. Conventional medicines typically use 0.2 to 5 mg of Belladonna alkaloids per tablet as an anti-spasmodic—roughly 1,000 to 25,000 times larger than the quantities used in Hyland's Teething Tablets. The side effects sometimes caused by conventional medicines delivering more than 0.2 mg of Belladonna alkaloids—such as dry mouth, blurred vision and urinary retention—are not associated with homeopathic medicines because of their minute dosage. 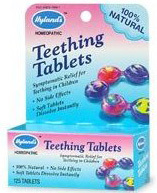 To put homeopathic dosages in perspective, typically a 10-pound child would need to ingest 1,000 Hyland's Teething Tablets (at least 6 bottles of 125 tablets) to exhibit even the first possible side effect of Belladonna . The FDA permits homeopathic products "intended solely for self-limiting disease conditions amenable to self-diagnosis (of symptoms) and treatment" to be marketed as OTC drugs . As far as I know, this is the first time the FDA has expressed concern about the safety of a homeopathic product manufactured in the United States. It would be interesting to know the details of the FDA tests, including the belladonna concentrations the agency found. It would also be interesting to know how the FDA determined that the reported adverse effects were caused by the product and not something else. Public protection regarding drugs is based on a framework of federal laws and regulations that require drugs to be safe, effective, and properly labeled. However, the FDA has not applied these rules to homeopathic products. They have been presumed safe, but unlike standard drugs, they have not been proven safe or effective against disease by scientific means (such as double-blind testing). To fully protect the public, our government should apply the same standards to homeopathic drugs as to standard OTC and prescription drugs: Their marketing should not be permitted without adequate evidence of effectiveness. Over the years, the agency has ordered a few marketers to stop claiming their products are effective in preventing or treating serious diseases. But lesser false claims have been ignored. Ari Brown, M.D. a prominent pediatric author who warned against using belladonna-containing teething tablets in her book Baby 411, has noted that teething gets blamed for fussy moods, disrupted sleep, runny noses, and diarrhea but rarely is the actual the cause of any of these. For relief, she recommends letting the infant gnaw on a frozen mini bagel or banana . Homeopathic Pharmacopeia of the United States. Washington, DC: Homeopathic Pharmacopoeia Convention of the United States, 1989. FDA Compliance Policy Guide 7132.15 for Homeopathic Products, revised March 1995. This article was revised on October 26, 2010.